Since Prime Minister Binyamin Netanyahu "postponed" enforcement of a Supreme Court demolition order for structures in the Nawaja'a outpost adjacent to Sussiya, construction has continued at the site and squatters have taken up residence in new, illegal structures. The building boom in the Arab outpost near Sussiya continues "full steam ahead," despite the Supreme Court's order to demolish a number of already-existing structures at the site that had been built in violation of an interim order (which freezes the status quo until a final decision is reached on the outpost 's future). When US Special Envoy Jason Greenblatt and President Trump's senior advisor Jared Kushner arrived for a round of talks with the Israeli government and the Palestinian Authority two weeks ago, Prime Minister Netanyahu decided to postpone the already-scheduled demolition operation at the PA-built Nawaja'a outpost near Sussiya. Apparently, Netanyahu's decision fueled a new wave of illegal construction, and in the time that has elapsed since the demolition operation was called off, a new residential structure has sprung up at the site, and several additional illegal residential shacks that were built last month received new tenants. The Nawaja'a Bedouin's illegal outpost was built between the Israeli community of Sussiya and the National Park at Ancient Sussiya. In 2011, Regavim petitioned the Supreme Court to enforce the demolition orders, but outpost inhabitants filed counter-suits - and kept right on building, cynically abusing the judicial process. 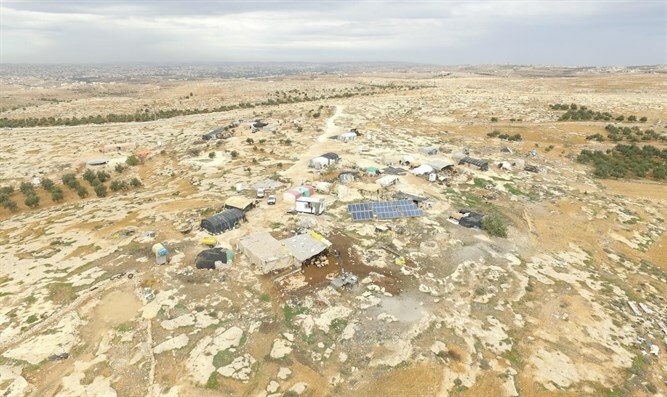 They even went so far as to demand the State of Israel allocate them an area of 1,500 dunams (more than 370 acres) and, in addition, recognize their present encampment as a new neighborhood of the Arab town of Yatta. Recently, former Defense Minister Moshe (Bogie) Yaalon tweeted that the Nawaja'a outpost is a project for which the European Union proudly takes credit. "The illegal construction and expansion carried out by the Bedouin/Palestinians at Sussiya is funded by European Union entities, whose behavior is both hypocritical and biased. Repeated attempts to reach a mutually-agreed upon resolution with the Nawaja'a have been unsuccessful; the squatters must be removed. "Construction of new buildings in the same week the demolition orders were postponed is a deliberate provocation. There's no point complaining about the Palestinian Authority or the European Union who pull the strings behind the Nawaja'a; they are simply acting to further their own interests, and to create illegal facts on the ground," said Yishai Hemo, Regavim's Field Coordinator for Judea and Samaria. "The people we should be complaining about are Prime Minister Netanyahu and Defense Minister Liberman, who have demonstrated weakness and ineffectuality, and are allowing this to happen only days after the demolition orders for Netiv HaAvot and West Tapuach were enforced."